More wind! – Live MoHo! Remember that wind from a couple of days ago? Well, its back. And this time its ANGRY! The weather service issued another wind warning, this time with gusts at 50mph advised. Seriously, why don’t they just leave this as a permanent status and simply update the wind speed numbers? And, we have found winds were consistently higher at the Kirtland FamCamp than what was being reported on the weather apps. Incidentally, FamCamp (Family Camp) is the military name for the on-base RV parking. We woke up at about 4:00am to hear the slide toppers rattling and shaking. Like really rattling and shaking. We decided to just leave them out and deal with it, because after 5 days here, we are grizzled veterans of the wind. but the noise made it impossible to sleep. Since we had to leave today to move to the RV park across from La Mesa and Freightliner for our service and repairs, I got out in the wind to unhook us and get prepped to leave. While it was really nice to stay on base, I will not miss that horrible wind. 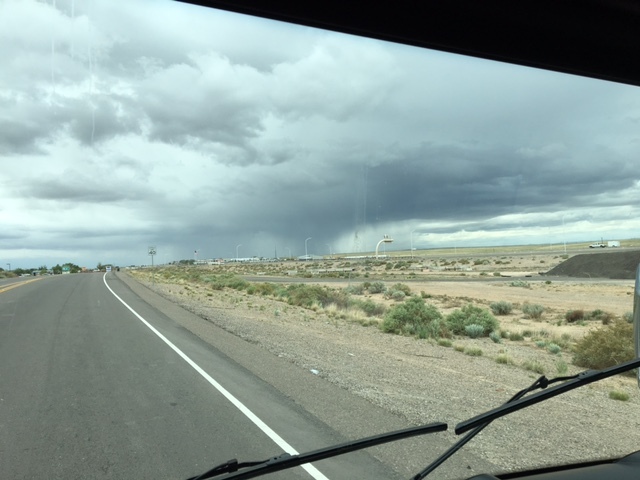 On the way across Albuquerque to the new RV park (we were on the Southeast side of town and were moving to the west side of town), we saw the rain coming in!! Yes!! No more dust!! When we arrived at new RV park, we saw that we had fine dirt blown into every crack and cranny in the MoHo.With a little water, we could have grown crops in the window frames. It was even sitting on top of both windshield wipers – I pulled them off the windshield and saw lines of powdered dirt where they were touching the glass. I got out the vacuum and sucked out as much as I could but I have a feeling we will be cleaning out grit for a while. 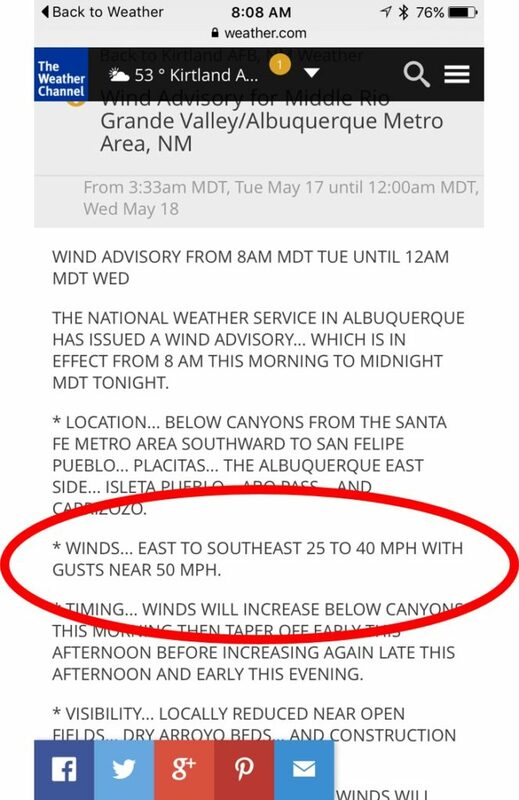 I can’t say that Albuquerque would be on my short list of places to live permanently if this constant wind and blowing grit is typical. Otherwise, it seems like a nice town with very impressive mountains to the east. American RV Park is quite nice as well, and decently affordable. Its the first park that we have stayed that provides a free continental breakfast.